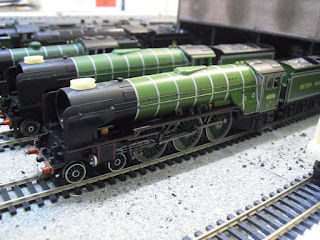 THE BRITISH RAILWAY STORIES LTD: "Of apple greens and things...Bachmann Tornado Conversion"
"Of apple greens and things...Bachmann Tornado Conversion"
'The time has come', the Modeller said, 'to talk of many things. 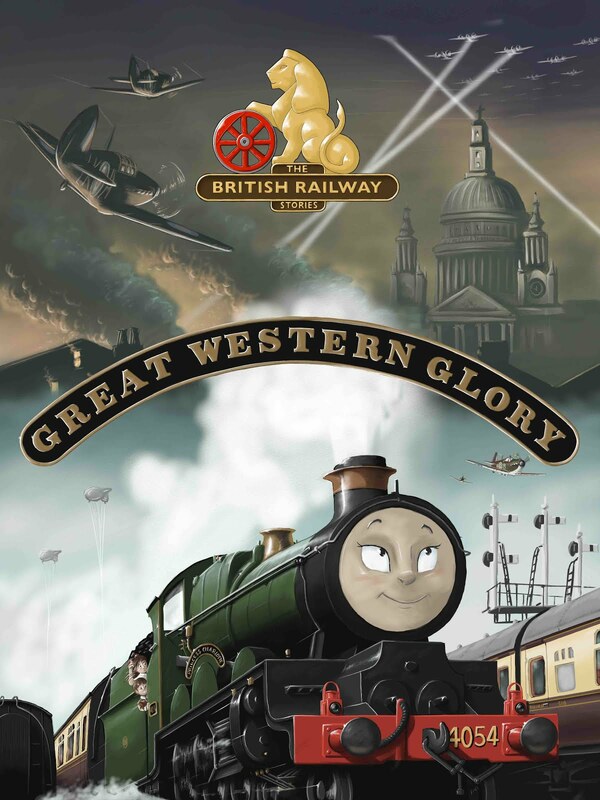 Of buffers - and chips - and chimney cracks, of apple greens and things..."
I'd had in mind for a good long time a conversion for the Bachmann Tornado model, more or less since it had come out in 2009. The only thing which isn't right really is the colour (At this point, it's worth remembering that both Doncaster and Darlington works built Peppercorn A1s). 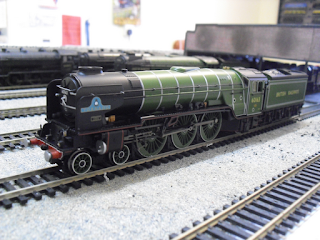 The colour you see on the Bachmann Tornado, being derived as it is from the real thing's livery it carried between 2009 and 2010, was actually a Doncaster apple green shade. Yes, there is a difference (a noticeable one at that) and a much lamented late acquaintance of mine had a particular eye for the colour of the Doncaster and Darlington built batches, commenting thusly that to make it a Doncaster shade you had to "add more yellow". Certainly, the Bachmann Tornado has more yellow in it than their previous W.P. Allen model (but bear in mind that one model is a decade older than the other). As it stands in ready to run Peppercorn A1s, we have a rather strange combination of apple greens; whereby the original Bachmann W.P. 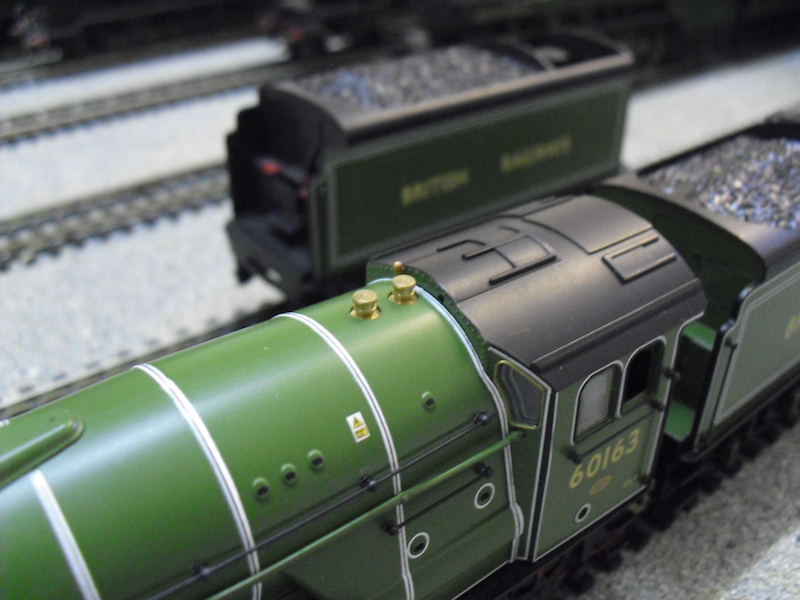 Allen model is closer to a Darlington specification, and the Tornado model (physically a Darlington locomotive) has a shade closer to a Doncaster specification...! 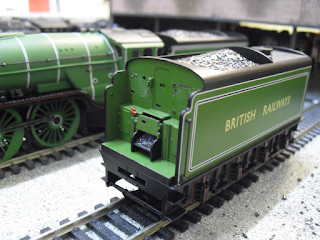 You can see the differences between the two models' livery later on in my blog. 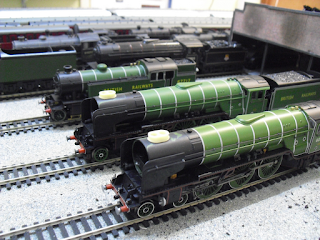 If you're particularly bothered by the shade (and I'm not particularly - hopefully they'll all be too weathered for it to be a big deal), then the only option is a full repaint in any event, and you wouldn't start with a Bachmann Tornado in any event if a full repaint is desired. This conversion avoids a lengthy repaint! As a case in point, it should also be absolutely no problem to turn a British Railways dark green Bachmann Tornado, or indeed (as I am hoping!) an express passenger blue Bachmann Tornado, into certain other members of the class A1 (so long as they are Darlington built batches). The model pictured above, was a second hand purchase for a very reasonable sum. Some bits and pieces were missing or damaged (the top electric light, for instance), and the chimney was cracked through (to be replaced by one of Graeme King's excellent resin chimneys anyway), but other than that I had managed to win a very decent starting point for conversion to one of the Darlington built A1s. The rivets being very obvious on the Doncaster tender, compared to the Darlington one on the left. In the case of my tender, however, I got a bit more than I was bargaining for! It turns out that this Tornado model has a number of printing errors, one of which is the tender, which has "British Railway" on one side, missing off the "S" at the end! 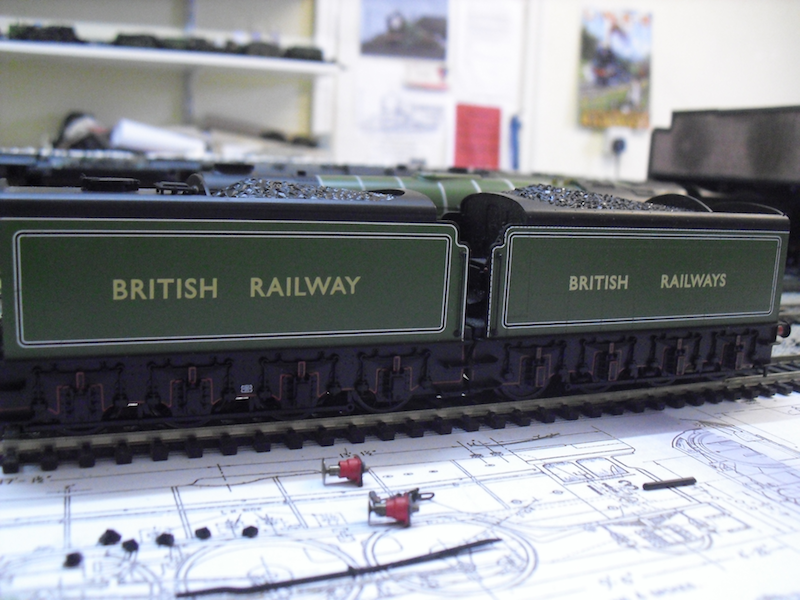 Luckily, I have spare transfers left over from a number of projects, and if a suitable "S" can be added without it looking too obvious, I'll do that rather than going the whole hog and removing the "British Railway" in its entirety! The tender body will require some significant modification to the correct A1 spec for the coal and water spaces: which is perfectly doable in my view, but will have to wait until Christmas when I can devote some time to carving up the tank. What can be done very quickly (and you'll see in a later photograph) is what can be done at the front of the tender very easily. One of the series of books I have found most useful for writing up my stocklist and generally looking for inspiration, is Yeadon's Register. In this case, Volume 3: The Raven, Thompson & Peppercorn Pacifics. On page 42, I spotted a photograph which made me laugh. It was a photograph of 60136 Alcazar. 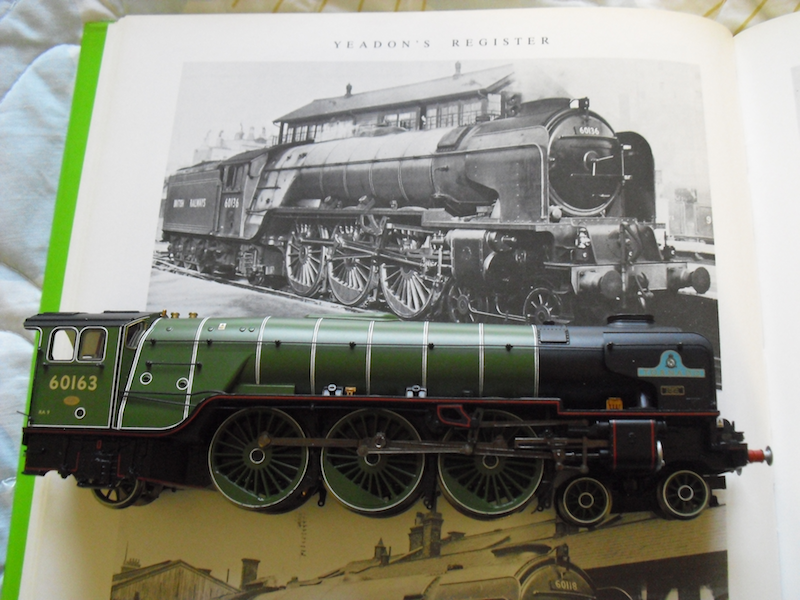 It was perfect in so many ways - I had 60163, and would convert it to its predecessor, 60136 (a numerical anagram, some might say) with removal of the Tornado accoutrements, including the extra whistle, nameplates and warning flashes. This was a conversion made a little easier by the fact it would not require "curly sixes" on cabsides and front numberplate! There is of course one more thing to remember: the whistle is in fact on the opposite side of the cab for Tornado. You need to remove this and put it back on the left hand side of the cab. The whistle should just prise out with little effort using some tweezers. So this is the stage I am up to thus far: chimney removed, and the base filed down so the Graeme King resin chimney can be fitted. The warning flashes on the front frames and on the boiler, removed using a cotton bud and a little Revell Colour Mix. The whistle has been moved from one side of the cab to the other. You will notice that a Doncaster built Peppercorn A1 is sitting on the other side of 60136. 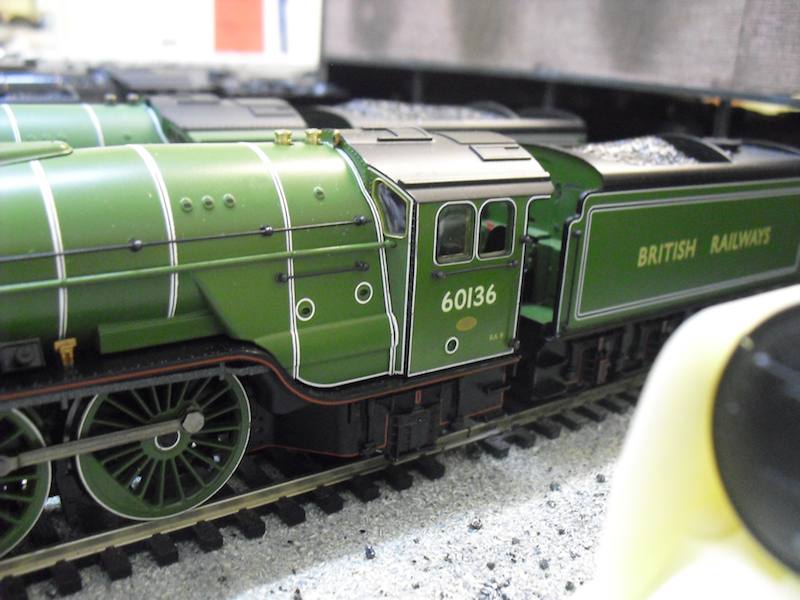 This locomotive is intended to become 60120 Kittiwake, albeit (as with 60136 here) unnamed. That one will require "curly sixes" and will prove more troublesome in that respect no doubt! The numbers 60163 were removed using a technique Chris Leigh wrote about in a recent issue of Model Rail, by using a flat head screwdriver and carefully rubbing across the numbers. It surprised me because it worked perfectly! I will now be using this technique more often on the Bachmann models. The tender had the extra cabinets of dials removed (the original A1s did not have these), and, when I go to carve up the coal space, I'll be filling in the gaps with putty. It also appears that I should be painting the backhead gloss black, to match the photographs of 60136 Alcazar I have. Until next time, where I will finally be able to get on with some weathering, as both my spray booth and air brush now finally have dedicated locations in my railway room, and the space in which to actually put some muck on some of my rather glossy models!